I have this reoccurring dream of being on-air at a radio station and not being able to find the next song to play. In the dream, it feels like my first shift in an unfamiliar studio. This dream began as a country music radio station - the format that I spent the most time with between 1989 - 1999 before I left the business. A song would be coming to an end and I would desperately try to find the next one to play, amid scores of rock records and CDs. Panic and frustration would build and dead air would ensue as I continued my frantic search for a country song to fill the dead air. In all iterations of this dream, there was a complete absence of a music filing system. Long-playing LPs, 45s, CD and carts (an 8-track tape-like thing that was used to play songs and commercials) were placed willy nilly with a complete absence of a country music section. It felt like everyone else had solved the mystery of where the right music was stored, except me. The anxiety was intense, the time running short. Last night's dream was different. The sense of it being a rock or country station was gone. Instead of trying to find a song of a particular format, I was just trying to find a song of any kind that I could play. It is like the dream had slowly and steadily devolved over the years to the point of complete and utter desperation. For the first time, the boss showed up and I broke down into a blubbering mess ; I had reached the end of my rope. I opened the door and left. Standing out in the fresh air I ran into a familiar face. "What are you up to?" I asked. "Oh? So did I. Fancy that." 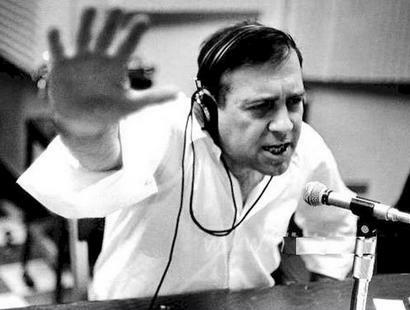 There was always a great fear of dead air in the radio business. As a program director, I would start counting if I was listening to one of my stations and dead air happened. "One, two, three....what the hell is going on?" I asked. "Four, five, six....maybe he got caught up in the bathroom." "Seven, eight, nine....it could be the transmitter." I don't remember being in a studio where songs were impossible to find, though each one was vastly different in terms of how they played, stored and organized their music. Eventually, computers took over and the era of vast record and CD libraries came to an end. It was a business that absorbed every facet of my life for a full decade. I never shut if off; there was no clear division between work and home. Maybe there was an element of trauma in that experience that I'm still trying to reconcile in my dreams? I'm not sure. Now that I've quit, maybe so too will that dream. I hope so anyway.